It’s been a terrible week for the news business. Brian Williams has been handed a suspension without pay for six months, or as I’m calling it, “book leave.” Jon Stewart is leaving The Daily Show to have dinner with his kids. And Bob Simon, whose latest stop in a distinguished career was 60 Minutes, was killed in a car accident. Which is senseless, but not as senseless as those three Muslim kids in North Carolina who got shot by their neighbor. Over a supposed parking dispute? And somehow, we’re searching for an explanation. The alleged shooter – who has confessed, btw, was an….atheist. Which explains it about as well as a Christian or Jew killing them would. Which is to say, not at all. Then there’s Kayla Mueller, the young woman from Arizona who died in Syria after more than a year in captivity at the hands of those people who are doing terrible things in the name of Islam. Other than returning the world to the time when we lived in caves and threw rocks at each other, it’s hard to figure out exactly what they’re after. I am starting to think none of this religion stuff matters very much except as a veil for mean people to hide behind and decent ones to wear in order to try and make the world and their lives better. Based on news reports about them, Deah Shaddy Barakat, Yusor and Razan Mohammad Abu-Salha, and Kayla Mueller fell into the latter category. 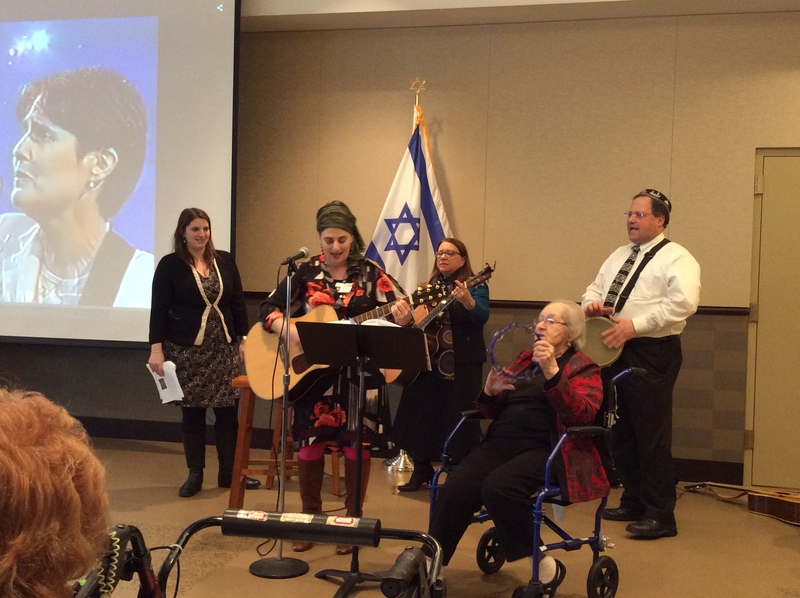 Moving on – as best we can after change happens – a few weeks ago was Debbie Friedman’s yahrzeit – the fourth anniversary of her death. Her birthday is coming up in a couple of weeks. She would have been 64. Not a day goes by when my mother and aunts – who considered most of their kid pile one amorphous group of offspring – aren’t thinking of her. Debbie might not have lived as long as her family and friends and the millions (I am not exaggerating here) of people who loved her music wanted her to. My sister and I were sure we would hang out being old ladies together with Debbie and her sisters. But she lived long enough to be remembered by people she never met. Some of those people work at the nursing home where Mom lives. One, the music therapist and activities person, Amy, approached me about six months ago with an idea. What did I think? I thought it would be great. The next thing I knew, Amy had Trish involved. Trish is the activities director on the assisted living side of the house, where Mom lived before she moved to the nursing home. Trish’s daughter Lauren and my Alex were playmates from the time they were about four. Now they’re both married – to Canadians – and living above the 48th parallel. Anyway, Trish is an activities genius. So I told Trish about The Box. Mom has saved every scrap of paper from Debbie’s career that she ever acquired. I had it in a box to send to Aunt Freda for what will surely be some Debbie Friedman Archive somewhere someday that scholars will seek out. People will have to wear gloves to handle stuff that was jammed into various bags and between pages in books until I was tossing and sorting things in advance of her moves to where she is now. Trish was very excited about The Box, and started making noises about a display table. She also made noises elsewhere. By the time Concert Day arrived, there’d been a squib in the local Jewish paper and a slew of local rabbis and cantors had signed on to take part. Mom and I each got to pick a song to sing. She picked L’chi Lach, because she loves it. I picked “Set me for a Seal,” because Debbie wrote it for my sister and brother-in-law’s wedding and we sang it together under the chuppah. She taught it to me, and then, intermittently for the entire weekend up to the wedding itself, my cell phone would ring and I’d pick it up and say hello. So I’d sing it for her. Anyway, what with the Parkinson’s and all, Mom’s voice sometimes gives out. Also, I didn’t want her to have to stress about finding a key in which to sing. So we decided to do it with cello backup. That way, I could follow her around. Also, I played the melody through once, bowing, and then plucked so she could hear but the cello wouldn’t overpower her voice. It worked well. Mother/daughter bonding: Stillish life with cello. That’s Debbie on the movie screen. Mom was singing L’chi Lach. When she had her bat mitzvah in 2004, Mom led MiSheberach, Debbie’s setting of the healing prayer. Debbie stood behind her and played while Mom sang. At this concert, Rabbi Steve Adams did that prayer and he asked me to play guitar. I stood behind him the same way Debbie had for Mom. It was my quiet shoutout to both of them. We were first, but before that was the best millennial part. Thanks to technology, I was able to get Aunt Freda up on FaceTime and she got to see the 200 people who’d showed up. I introduced her to the rabbis and cantors, showed her the display table and then shoved the microphone up to my i-pad. She thanked everyone for coming, and heard the audible gasp of disbelief when she said that Debbie was so afraid that no one would remember her music. We lost the connection somewhere between the first and second song, but it was a truly lovely and meaningful afternoon, and I felt connected to Debbie, my family and the community in a way I hadn’t before. That’s Mom on timbrel for “Miriam’s Song.” Amy the activities goddess is playing guitar. Behind her are Cantors Lauren Phillips, Karen Berman and David Barash (with his tabla). We were in front of a theater-sized screen with an image of Debbie on it. 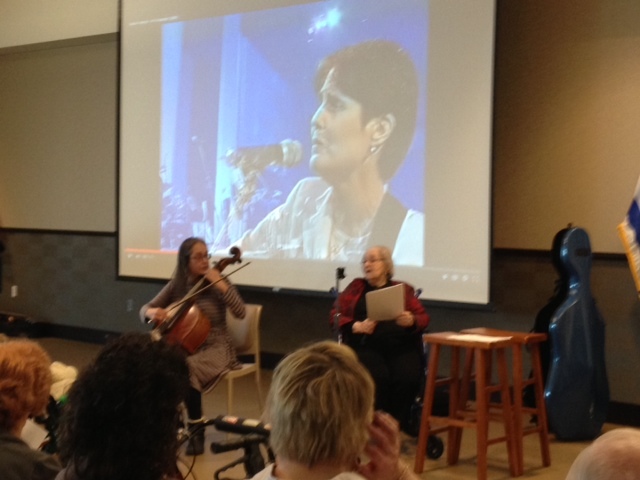 As the last song, we sang “T’filat Haderech (The Traveler’s Prayer).” But it was Debbie singing on the screen, and we all picked her key and played our instruments and sang with her. I was very involved in making sure I was in tune, in time and listening to the other musicians (this was our first and dress rehearsal as well as the performance) so it wasn’t until the song was over that I looked over to find Mom, crying her eyes out and pretty much a mess. For a second, I felt like the worst and most selfish person in the world. Here I was, sawing away on my cello while my mother was falling apart five feet away and I hadn’t noticed. Then, I realized that it didn’t matter. Trish, Amy and other people she knew and loved were there, comforting her and lifting her up. If Debbie could have seen it, she would have hugged those women and invited them to dinner. By the time Mom was at a point where she had to move, Debbie was dead. Mom chose Milwaukee. We all loved the idea of Mom & her sisters together, but California wasn’t practical. Debbie would have hated it too, and agreed. She would have been a regular presence in Mom’s life, calling, visiting, singing and comforting. What I realized in the moment after catching sight of my weeping mother, surrounded by so many loving women, is that even death hasn’t stopped Debbie from that. Lovely tribute…and such a heartfelt experience for your mother. I’m one of those who didn’t know Debbie–although I did meet her in suburban NY when friends of a dear friend recovering from aggressive cancer had Debbie “do” her healing songs at my friend’s home. I was a fortunate friend who rushed over after work to be a part of probably the most inspirational hour I’ve ever been part of. Miraculously, now 15 years later, my friend has had an active life. Debbie, of course, is gone, but she does live on in another way for many. Thank you for that memory, Susan. And I’m glad your friend is doing well.